With strong winds and cold wave warnings in effect in some parts of Incheon on Friday, all passenger ferry services linking Incheon to islands have been canceled. On Friday, a strong-wind warning was issued for most parts of the eastern and western coasts of Korea. According to the Incheon Weather Station, the temperature in Incheon dropped to minus 7.7 degrees C at 9 a.m. Friday, with the wind chill temperature at minus 14.5 C.
Strong winds at speeds of 14 to 20 meters per second were blowing Friday morning. Fourteen ferries operating 11 routes have been suspended, according to Incheon Port Management Corp. 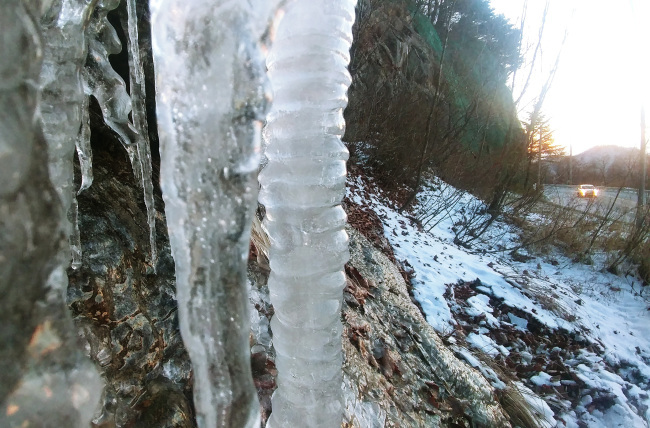 Cold wave warnings have also been issued for Gyeonggi Province, Gangwon Province, North Chungcheong Province, and some cities and counties of North Gyeongsang Province. Daegwallyeong in Gangwon Province had the lowest temperature across the country Friday morning, with the temperature dipping to minus 11.7 C and the wind chill temperature recording minus 21.7 C.
As of 9 a.m., morning temperatures in major cities hovered around minus 8.8 C in Seoul, minus 6.3 C in Suwon, minus 7.5 C in Chuncheon, minus 3 C in Jeonju, minus 2.5 C in Daegu, and 1.4 C in Busan. This was 7 to 8 C lower than the annual average of minus 1.7 C.
In addition, a heavy snowfall warning has been issued for some parts of South Jeolla Province. Meanwhile, Gwangju saw its first snow of the year Friday. Snowfall will spread to most parts of South Jeolla Province, except the southeastern coast, and is expected to continue until Saturday. The cold spell has been forecast to continue for a while, with this weekend’s temperatures expected to be 4 to 5 C lower than the annual average.